Facebook’s dominance as the most popular social media platform for Premier League clubs continues to grow at an impressive rate. The number of Facebook followers of clubs’ official pages has more than doubled since reaching 100 million followers in November 2013, with the clubs in the 2015/16 tournament having a combined 218 million followers between them (even removing the three newly-promoted clubs leaves a total of 217 million). Facebook makes up over three-fourths of total social media followers for clubs’ official accounts. Twitter and Instagram have 36 million and 24 million followers, respectively. 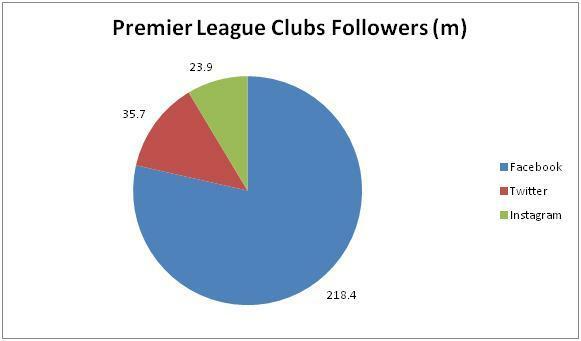 This impressive growth has been driven by a surge in the number of followers for the top clubs. Arsenal, Chelsea, Liverpool, Manchester City, and Manchester United have a combined 195 million followers, making up 89 per cent of the total. Manchester United continues to lead the pack, averaging an additional each of 936,000 followers month since reaching 50 million in June 2014. No other Premier League club has yet to reach the 50 million mark. Indonesia continues to have most Facebook followers across all countries, making up 10 per cent of the total with 21.8 million followers. Indonesian football fans’ passion for the Premier League shows no sign of slowing down, with their numbers on Facebook reflecting the huge TV audiences the league receives on free-to-air television in that market. Country Premier League Followers Followers/Country Pop. However, Indonesian fans’ dominance on Facebook could soon be challenged; India is currently a distant second on the list, making up 5 per cent of Premier League followers. Yet this number represents less than 1 per cent of the country’s population. Its huge population, historical ties to the UK, and growing interest in global football—as evidenced by the rise of the nascent Indian Super League and its recruitment of top European players—make India an attractive growth market for the Premier League. The data demonstrate it is one that is ripe for clubs to start seriously cultivating fan roots as they had done in Indonesia and other developing Asian markets. Furthermore, India is now the second-largest market for Facebook, with over 125 million average users and growing. Facebook has even launched a 2G-friendly mobile app for users with slow internet connections. We expect Premier League club followers from India to grow rapidly. 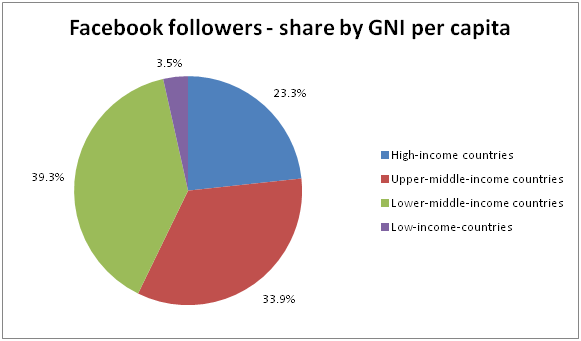 The vast majority of Premier League Facebook followers comes from Middle Income Countries (MICs), as calculated using the World Bank Atlas method (Gross national income per capita of more than USD $1,045 but less than $12,736), making up 79 per cent of the total; lower-middle-income countries, of which India, Indonesia, Vietnam, and Egypt belong, make up the largest share with 39 per cent. The rapid growth in followers from MICs demonstrate that clubs must continue to pay attention to these markets in the crucial years in which football fans with growing incomes and ability to connect are developing their football consumption habits. The social media popularity of the league in these markets will grow in leaps and bounds as increasingly valuable Premier League TV rights deals attract ever-larger audiences, as seen in the case of Indonesia. Huge Facebook follower numbers do not add value to clubs and their sponsors unless fans are engaged efficiently across all markets and languages. To extract real value from their global popularity, clubs must focus on producing high-quality photos and video content that provides sponsors with measurable, organic exposure regardless of language barriers. It is crucial that clubs share highlights and interview videos that provide global fans with a common fan experience across markets, especially as the fragmentation of Premier League TV rights increase the variability of what fans see. Clubs provide high-quality visual content to engage their fans globally, especially in MICs where growing fanbases are gaining increased connectivity.